After stumbling twice on the rough terrain, Autumn thought she’d just badly sprained her right ankle. But a hospital X-ray later confirmed she had actually broken it - leaving her sidelined from athletics while the bone heals. Mum Sarah Grierson explained that because Autumn’s chest condition - pectus excavatum - pushes her ribs inward, leaving a gap big enough for a tennis ball, it can cause pressure on her lungs and make breathing more difficult. 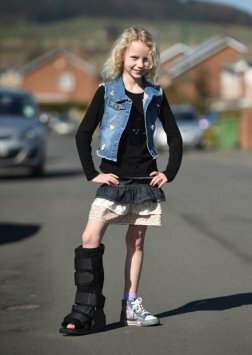 But Highcliffe Primary pupil Autumn loves running so much, it has taken a broken ankle, rather than her chest condition, to hold her back.